OSCEOLA, Iowa, Nov 16, 2018 (SEND2PRESS NEWSWIRE) -- Osceola, Iowa's SIMCO Drilling Equipment, Inc. took steps this week to address the risks surrounding dangerous weather - specifically tornado incidents like those seen in Pella and the Vermeer plant recently. With over two dozen employees housed in a steel-frame building, along with tons of manufacturing equipment, you can imagine what a similar incident would do to SIMCO, manufacturer of drilling rigs for water wells, geothermal drills, geotech soil sampling, and roadway pavement core drills. "We identify whole-heartedly with the Vermeer team. The Pella tornado disaster opened my eyes to the need to address storm safety here at SIMCO," said Darren Swolley, General Manager for SIMCO Drilling Equipment, Inc. "We want to take every precaution possible to ensure the safety of our employees." The three cellar-style shelters were dug in and placed, side-by-side, into the SIMCO property outside the main building. Each consists of steel reinforced concrete walls, roof, and floor measuring approximately 10-feet x 7-feet x 7-feet. Each storm shelter will keep up to 18 people safe during a storm emergency. 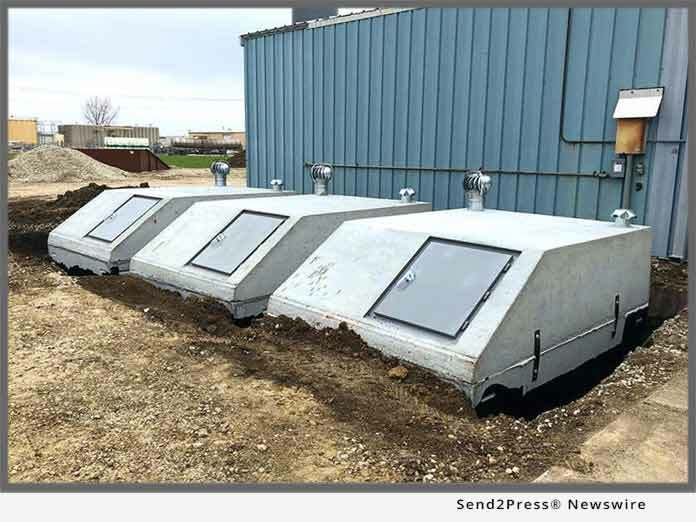 The units, manufactured by Midwest Storm Shelters, LLC near Joplin, Missouri, who has seen its own tornado troubles, were delivered to the SIMCO location in Osceola, Iowa and installed Tuesday. The SIMCO team, with help from Osceola's Andrew Construction Company, had the site prepared and completed the installation the same day. Steve Jurshak, Chief engineer at SIMCO Drilling Equipment, Inc. said, while preparing the site for installation, "We hope we will never have to use these storm shelters, but feel better knowing we are keeping our employees safe." For more information about the tornado shelter's installation and SIMCO Drilling Equipment, Inc., contact Darren Swolley, General Manager at 800-338-9925, or go to http://simcodrill.com/. News Source: SIMCO Drilling Equipment, Inc.